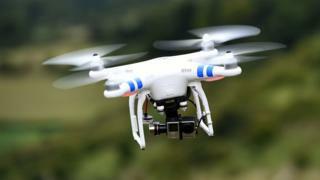 Drones flown by the general public are "a real and growing threat" to civilian aircraft, the head of aviation trade body Iata has warned. Tony Tyler called for drone regulations to be put in place before any serious accidents occur. He said the threat posed by unmanned aerial vehicles is still evolving. "I am as excited as you are about the prospect of having pizza delivered by a drone," he told a conference in Singapore. "But we cannot allow [drones] to be a hindrance or safety threat to commercial aviation," said Mr Tyler, director-general of the International Air Transport Association. "The issue is real. We have plenty of pilot reports of drones where they were not expected, particularly at low altitudes around airports," he added. "There is no denying that there is a real and growing threat to the safety of civilian aircraft [coming from drones]. "We need a sensible approach to regulation and a pragmatic method of enforcement for those who disregard rules and regulations and put others in danger." Drones were recently involved in four serious near-misses at UK airports, the UK Air Proximity Board said in January. The board, which investigates near-miss incidents in UK airspace, said a drone had come very close to colliding with a Boeing 737 that had taken off from Stansted airport. IATA's primary concern is drones flying at low altitudes near airports that could threaten planes taking off or landing, Rob Eagles of Iata said. Aviation regulators also want to make sure that the radio spectrum used to control the drones does not interfere with air traffic control systems, he said. In December the US government set up a registration system for Americans who own drones. Anyone who has a drone must register with the Federal Aviation Administration before the device takes its first flight. Owners have until Friday to register their details or face being fined. The move comes after several reported incidents of drones hindering emergency services' efforts in fighting fires and other dangers.